Preface: This post is not me telling you to not use Apple. These are only my opinions, and reasons why I personally avoid Apple products. When I develop things I try to be as platform agnostic as possible in everything I do. If you know me, you know I’ve got a fervent dislike for all things Apple. Often people simply assume I’m a Linux (or worse: Microsoft) fanboy and my feelings about Apple are coloured by my passion for another system. This isn’t true. My distaste for Apple is a deeply philosophical one, nothing really to do with surface problems like OSX key bindings, or HSF+ file system meta data. It wasn’t always like this, Apple really only fell out of my favour recently. It’s a long story, so I’ve broken my rant down into bite sized sections. You may love Apple, but Apple doesn’t even like you, not even a little bit – it’s harsh but true. Each new “upgrade”, whether it be to their desktop or mobile OS, comes with many new “features” as well as the quiet removal of a few others. It’s to the point now where it’s considered normal when you want to put a new song on your 2005 iPod to: Get required update for iTunes -> That requires an update for OSX -> That requires an Intel Processor -> That requires a new Mac. Obviously this is a smarmy tactic by Apple attempting to get you to upgrade – people feel powerless and are ultimately coerced to upgrade even if they don’t really need to. Furthermore, their blatant disregard for established standards and platform interoperability cost you more too! Non-standard adapters for any video output. Restrictions on who can even open your machine without voiding warranty (forget about upgrading). You can’t even boot off a USB stick ([ninja-edit: apparently you can now on new MBPs]). You can’t write to Windows formatted NTFS drives. You can’t install non-Apple-approved software on your iPhone/iPad (and I predict on your OSX desktop by 2015). All things that fans will pipe up with “work arounds” and hacks that will fix your issue, but break Apple’s legal rules in doing so — they seem fine with this and I can’t even begin to fathom why. Let’s do some comparison shopping. 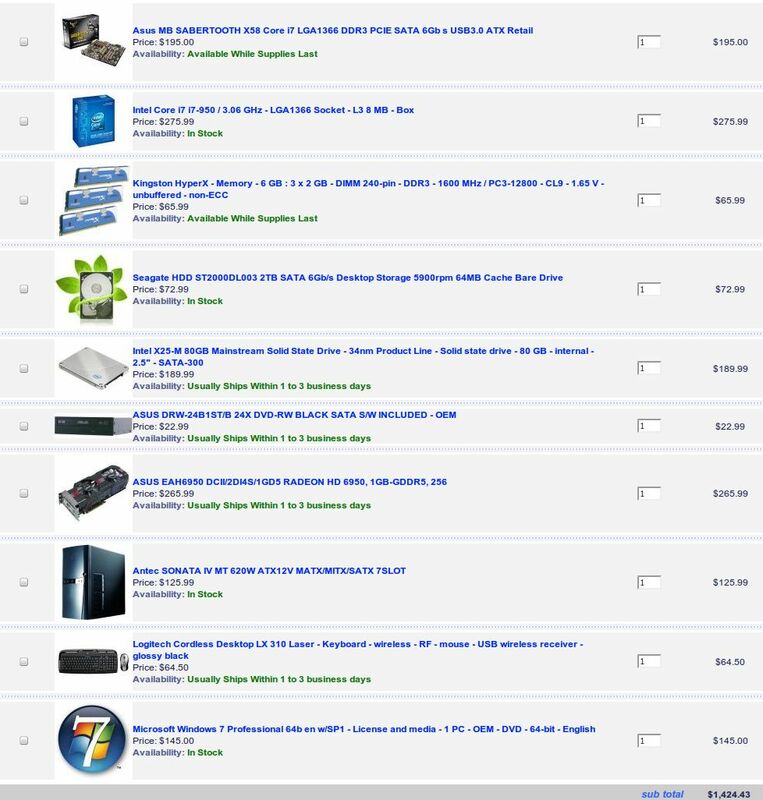 A high end Apple desktop goes for about $2700 (Intel 2.8Ghz Xeon, 3GB RAM, 1TB HD, ATI 5770 1GB, Apple KB + Mouse). A high end custom-built PC goes for less than $1500 — AND the PC will be more powerful too: (Intel i7 3.0Ghz, 6GB RAM, 2TB HD + 1 80GB SSD, ATI 6950 1GB, Logitech KB + Mouse, Win7 Pro x64). If you’re not savvy those appear as just numbers and letters – they probably mean very little to you. However you can still infer details; things like twice the size of hard drive, twice the amount of RAM, a video card that is literally a whole generation newer. Those that are savvy will notice small things like the Apple has a server processor in it (why?! ), and that the PC build includes a lightning fast SSD to put the OS on — I even included a Windows 7 Pro license! You could save even more by using Linux. This doesn’t even touch on the other things Apple gouges you for: proprietary Apple video adapters, “AppleCare”, virtually all software by both 3rd party developers and by Apple themselves. Throughout the whole life-cycle of your computer you will always pay more using Apple hardware. For me, this is the most important issue. It won’t be for 99.9% of the rest of the people on Earth and I’m fine with that. I won’t go too deep (like I do in my ‘sharing is caring‘ post), but essentially what it boils down to is simple: Apple is bad for digital freedom. It’s strange, when someone asks why I don’t like Apple, or I get into a discussion about it this is often the first thing that pops into my head “Apple is bad for freedom” – and to the uninitiated it seems ludicrous and I can see it in their reactions: “This guy is crazy”. Imagine with me a scenario that plays out in the year 2017: Apple continues to dominate the mobile market and has virtually cornered the market of media distribution, this includes: Your music, your videos, your apps, your ebooks and your newspaper/magazine subscriptions. All this content must only be viewed on your iTunes validated iOS device. You have effectively cut off the 60% of the world population from viewing that content – either because they are flat out too poor to afford an iOS device (let alone content for it), or because they don’t have a credit card, or because “this content isn’t available for viewing in your country” (something us Canadians are already getting a taste of). We must recognize this for what it is: a massive step backwards. Somewhere in the slums of India, Brazil, China or Thailand there are children with the minds of Einstein, Monet, and Shakespeare – minds that will rot because we have denied them the ability to learn – not because we just can’t (as was the case before the internet), but because we let a handful monolithic corporations control how we view and distribute media. Think about what a travesty that is, and think how easily avoided it is. And *THAT*, succinctly speaking, is why Apple is bad for freedom. This is only one facet of a complicated problem that I could go on and on and on about – and if you’re still not convinced, please ask me about it. This isn’t so much something they’ve done wrong, but something they’re abusing. The kind of image Apple cultivates is nothing short of astonishing – they’ve set themselves up in such a way that old, easily disproved idioms like “Macs are for designers” that “Macs Just Work” and that each new iteration of hardware is “Magical” or “Revolutionary” continue to work in their favor. It’s truly unreal that they’re not only capable of marketing such non-sense, but that it also is working for them. I can only hope that over time the sheen from happy new Apple products wears off on the general public and that people wise up that maybe each new generation is only slightly better from the last and maybe it’s not quite as “magical” as they’ve been lead to believe (for all the above mentioned reasons). All that said – I agree with the masses on one thing: that Apple hardware is very pretty, their designs are second to none almost all the time. However for me, it’s far from ‘pretty’ enough to make me give up so much. If Apple switched their stance on how closed their products and services are I would become a fan almost overnight (imagine an iTunes API?!) – but they won’t, the money they’re making from their current business model is just too lucrative and they can see the proprietary media lock-in in the future (especially as they partner with the already-established-as-evil media conglomerates). I think it speaks volumes about us as a culture that so many disadvantages are glossed over in the name of aesthetics and marketing-hype.